SEATTLE, WA (No vember 26, 2018) — The University of Washington’s annual Business Plan Competition has a new name: The Dempsey Startup Competition. 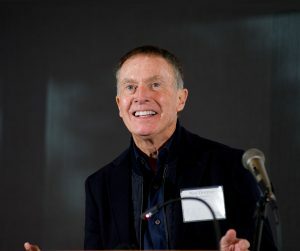 The change comes as recognition of a generous donation from alumnus Neal Dempsey, a longtime benefactor and Managing General Partner of Bay Partners, one of the earliest Silicon Valley venture capital firms. The gift to the Foster School of Business’s Buerk Center for Entrepreneurship will make a significant impact on a startup competition with a storied history; over the past 21 years, the competition has empowered nearly 5,000 student entrepreneurs with expert mentorship and seed funding. Dempsey’s confidence comes from his own success story as well as his mentorship of countless students and entrepreneurs. “Neal’s Running Start,” an opportunity for early stage entrepreneurs to spend one month learning from, and with, Dempsey, is just one example of his passion to inspire others. The Dempsey Startup Competition will maintain the multi-stage format of the original competition and time frame, starting each year in the spring. However, the name change allows for the Buerk Center to emphasize more than just development of a business plan, including a greater focus on customer discovery, market research, understanding the competition, and creating a strong pitch deck. Dempsey’s support also will help grow the competition in terms of its student reach, expanding beyond the borders of Washington state. Registration for the 2019 Dempsey Startup Competition begins March 18, 2019 and the deadline for teams to enter is April 8. For more information about the competition, visit foster.uw.edu/dempsey-startup. For more information about Neal Dempsey, visit nealdempsey.com, or contact Jane Gideon, Incendio International, jane@incendiopr.com, 415-682-9292.